There are two reasons why I am writing this post: (1) because I am always wondering what to give my parents for the holidays and (2) because I never have time to read anymore. So when I was asked to review Downpour.com, I was intrigued because here was a product that might solve two of my biggest dilemmas. Downpour.com is an audiobook rental site. This is new technology, as there are not audio rentals out on the market that can download to your Android device or iPhone and remove itself after the rental period is over. Yes, you can buy audio books, and yes, you can rent digital books, but not the concept combined. My parents travel a lot (lucky retirees) and often drive to their destinations. My father has always rented or borrowed audio books from the library to listen to while he is driving. The downside is that once you listen to it, you can’t get a new one until you return to your original departure point! With a site like Downpour.com, once you finish listening, you can digitally return it and get a new one. A big bonus for dear ol’ Dad! In some places to which my parents travel, they can’t bring certain books because of cultures and beliefs. With audio books, they can discretely listen using their phone and a headset or earphones, and as long as they have internet connection, they can keep refreshing their audiobooks while saving room in the suitcase from bulky books! As for me, I don’t have time anymore with two dogs and two young kids. I am, however, often in the car driving them to school, back from school, to practice or to a lesson. Once there, I often don’t read a book because I need to be watching my kids. If I can listen to a book, however, I can pass the time while still being able to see them swim in the pool or tumble on a mat at their extracurricular activities. Then I can seamlessly pick up where I left off when I am driving, using my car’s bluetooth system. It’s Mom nirvana! It’s something my husband might like for his daily commute (and it is a doozy!) So if he is bored with talk radio, he has options! Downpour also has Children’s and Young Adult audio book titles so it is great on vacations or those car rides to Grandma’s House. So how it works is that you need to have a Android or iOS device (tablet, iPad, iPhone, smartphone, computer). Go to Downpour.com and create a free account. 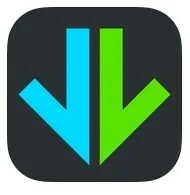 Then download the Downpour.com app on iTunes or Google Play. You select an audiobook on the website, like the Hunger Games, and pay, in this case, a $7.95 rental. (Prices vary.) You can rent audio books for 30 days. The clock starts when you start reading, or 10 days after purchase (and the rental period is 60 days for longer books.) The audiobook will appear in your Downpour app’s library. Rentals offer up to a 70% discount over buying, offers the same listening experience as a purchased title, and they free up space when you are done. Yes, you don’t own it once you are done, and audio book rentals are still free from the library. However, this is a good, extra, option, and you can listen on your iPad and then pick up where you left off on your iPhone. Making the price worth the flexibility. So I’m off to buy a gift card for my Dad and hubby! What perfect timing! I received a free audiobook rental and compensation for the time for my review. No one and nothing influenced my review or the content of my review.